Healthcare providers are always on the lookout for symptoms that may indicate an infection. They check body temperature, incision sites, ventilator tubes, catheter output, heart rate, oxygen levels, and every other possible source of information for any hints of infection. Once an infection is suspected, samples must taken and sent to the laboratory for testing. Depending on the location of the suspected infection, different samples will be taken. Pneumonia, located in the lung, requires samples of phlegm that have not been contaminated by saliva or a ventilator component. To confirm a bloodstream infection, blood samples from the vein and from the bloodstream catheter are taken. Catheter-associated urinary tract infections require testing urine directly from the bladder. Gastrointestinal infections are diagnosed using stool samples, while surgical site infections often use tissue samples. Once the correct sample is in the lab, a variety of methods are used to reveal whether pathogenic bacteria are present. 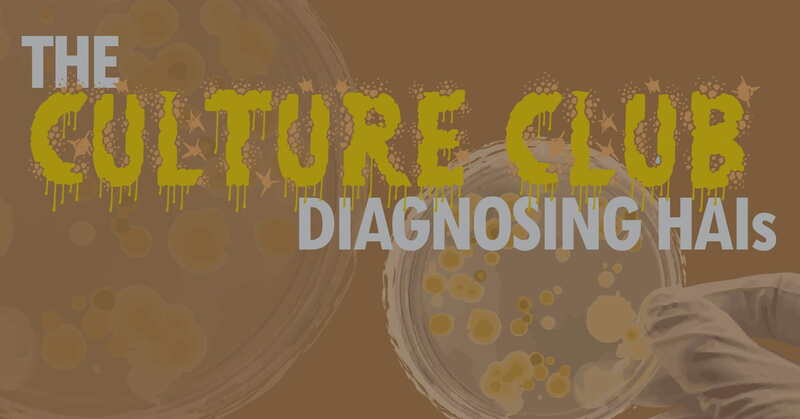 One type of test involves culturing the sample for bacteria. To culture bacteria, the sample is placed in a medium that promotes growth in the bacteria - the right temperature, enough nutrition, etc. After a set period of time, the growth medium is examined under a microscope to see if colonies have formed. If bacteria are present, the next step may involve gram staining or acid-fast staining, during which a dye is added to the bacteria. Depending on whether or not the bacteria absorbs the dye and changes color, the physician will be able to determine if the bacteria is gram negative or gram positive. The answer will help determine what antibiotic to use. An infection can be diagnosed by directly measuring the pathogen, but it can also be detected by testing for effects of that pathogen. Bacteria have surface proteins called antigens that our body detects as foreign material that must be attacked. If our immune system is responding as it should, once these antigens are detected, our body will release antibodies to seek out those antigens, bond with them, and destroy the bacteria cell. This process leaves chemical markers in our blood that can be picked up by a variety of laboratory tests that use dye to attach to antibodies or antigens. Along these same lines, there are tests that identify the toxins release by specific pathogens, such as C. difficile. Today's technological advances allow physicians to test samples for bacteria at the genomic - or DNA - level. These tests use advanced genetic sequencing to identify markers for specific pathogens. Polymerase Chain Reaction (PCR) testing is particularly helpful, since it enables a lab to create an enormous number of identical DNA segments that can then be used to identify a pathogen. PCR testing is extremely helpful when the pathogen is a slow-growing culture (such as tuberculosis), since any delay to treatment can be dangerous to the patient. Multiplex PCR is a new technology that allows for multiple strands of DNA from a variety of sources to be copied, allowing a doctor to identify one pathogen from a sample with many types of bacteria present (such as a stool sample). Today's post merely touches on the incredible work done by laboratories in support of the medical teams treating patients. This work is often unsung, unseen, and underappreciated. (Just watch a medical TV show to see how thankless the job of lab technician can be!) However, it is the painstaking work of these individuals that helps determine treatment, alerts doctors to possible outbreaks, and provides the data that can help identify a possible source of contamination. We hope to explore more about this essential hospital department in future posts.